A couple weeks ago I was inspired by a review activity that AP environmental science (APES) students did at Prospect High School. In the activity, students were split into groups and assigned a topic in which they had to visually represent the most important concepts, diagrams, and terms within their topic. 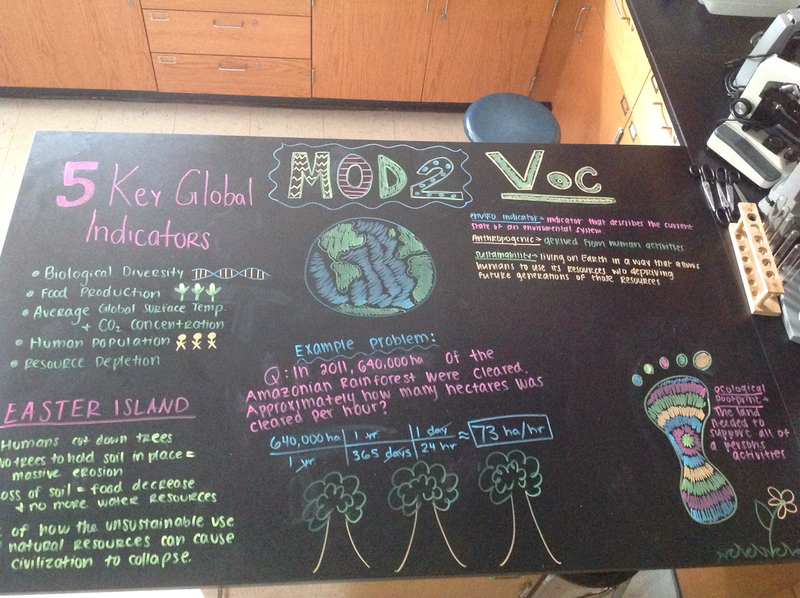 Students used neon-colored wet-erase markers on the black science lab tables and had great results. A lab table one day, and a make-shift "whiteboard" table the next. Time to get some markers! Neon wet-erase markers on science lab tables. I decided to try my own spin on it and have groups of students rotate around the room answering one of six questions for one of six topics. After six rounds, each group will have answered one question per topic. 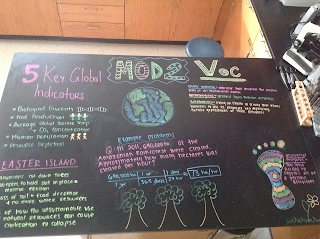 I used big pieces of butcher paper for this unit - going to give wet-erase markers a try the next time. This jigsaw strategy is nothing new, however technology can lend a hand in making the end products accessible for students outside of class. After each poster's topic was finished, one student from the group took a picture and uploaded it to a Schoology Media Album. This media album provided another resource for my students before their first big test. I asked my APES students at the end of the jigsaw activity if they liked it and I got an overwhelming "Yes." I told them that I had seen this done another way, where each group was in charge of single topic and on student responded, "Oh yeah, that'd be cool too"! My goal is to pool these resources both on paper and on schoology throughout the year, so that when the AP review starts in April, we'll have lots of resources to draw from. There are very less people who thinks for the betterment of school for a long time, others are mostly interested in just doing their job. I must say this post deserves a thumbs up!